Chef David Zingg is a 27-year-old chef from Palm Springs, CA. After high school, he moved to Hawaii where he acquired a pallet for multiple styles of food (Chinese, Japanese, Korean, Thai, and Hawaiian). Known for his creative and adventurous style, Chef Zingg hitchhiked from Portland, OR to Florida with just his knives and a backpack. 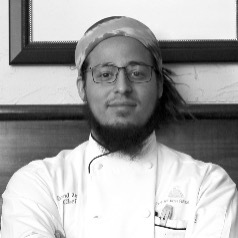 In Key West, Chef Zingg has worked at Spencer’s By the Sea at the Reach Hotel, Kelly's Caribbean Bar, Grill, and Brewery, and he was recently named one of “7 Hot Chefs to Plan Your Next Vay-k Around” by FabFitFun Magazine. Chef Zingg is currently working at the Blue Macaw Island Eats & Bar.